Leading artists reveal why the Google Tilt Brush is set to change everything. Every now and again, something comes along that shakes the creative industries wildly, causing art directors to spin with excitement and changing everything, forever. The first computers did it. Photoshop did it. Does Google’s new virtual reality Tilt Brush mark the cusp of another seismic change for artists? According to Darren Bacon, yes. The lead concept artist at 343 Industries – a division of Microsoft developing the Halo franchise – predicts limitless possibilities for VR as a production art tool. “One of the first reactions I had to trying the technology was that VR and Tilt Brush – being first to market – are likely to be in every corner of the design/art industries soon,” he says. Tilt Brush enables anybody to create in a 3D space with just the wave of a hand. You can step in, around and through your drawings. And, because it’s VR, you’re free to use unusual materials such as fire and snowflakes, should you wish. Senior concept artist Geoffrey Ernault bought an HTC Vive from the official website. He almost gave up after his initial attempt, labelling it “gimmicky” and “hard to get into”. 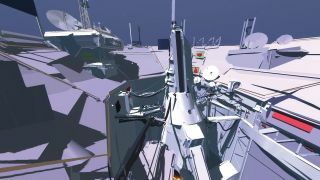 Then he saw Sparth’s images and gave it another go. “One thing that needs some getting used to is standing up while drawing,” says illustrator Christoph Niemann, who was invited with five other artists to play with the Tilt Brush as part of Virtual Art Sessions, a Chrome Experiment. “Keep in mind the highest point in your scene,” warns Geoffrey, “and try to limit that, otherwise you’ll have your arms up for the whole duration and you can quickly get arm ache.” He had to jump to reach the highest points in his recent artwork. Darren agrees that it takes some time to get used to the new workspace. He uses markers on the floor – where the carpet ends, for instance – to provide clues as to his location in the physical room and whether he might need to teleport to another location in Tilt Brush. “There’s a visible grid that reminds you of your boundaries, but even with that it took a few hours to get to a point where I could really move and not be too timid in movement,” he says. So what of its potential? On a practical level, it’s never been easier for artists to translate 3D ideas into a 3D space. “Another thing I find really intriguing is the ability to experience my designs ‘in person’,” says Darren. “For a long time I’ve debated over whether or not I should get into 3D printing, but I’ve never pulled the trigger because of the costs and software knowledge needed to get a good result. All the artists agreed we spoke to that it’s worth finding a rig nearby: try your local Currys PC World if you’re in the UK, or certain GameStop and Microsoft Store locations in the US.